Most people have an excellent sense of what can be dangerous, but mindfulness goes a long way. Reviewing safety practices is a good way to keep those things in the forefront of your thoughts, especially since we use kitchen appliances all the time. The dishwasher is a secret devil. Not only can the steam escaping from a just-finished cycle scald you, but over 60% of all dishwashers have hazardous fungi growing in them. This article explains how to clean your dishwasher with vinegar, baking soda, and bleach. Over-boil is always a danger, and sometimes food is much hotter than we think. Everyone has heard of someone who has had something explode from the heat in their microwave. Metal in the Microwave is also a no-no, as is a microwave with a bent or warped door, or one with any damage which makes the door hard to close. Discard these units immediately. This is your number one house fire starter (since everyone quit smoking), usually caused by inattentive cooking. Other culprits? Potholders, towels and other flammables by the stove, especially if a pet jumps on the counter, and not keeping the area free of grease. Pot handles should always be turned toward the back of the stove, and the back burners used first. Most of the trouble from your oven comes in the form of contact burns by using the oven accessories improperly: a towel instead of an oven mitt, reaching into the oven instead of pulling out the rack to check food for doneness. Other causes: leaving the door open for any reason, Having a dirty oven or using a wet towel as an oven mitt, using the inside of the oven for storage, or changing the level of the racks after you’ve already turned on the oven. Trifecta of the toaster: burns, shocks, and fires. 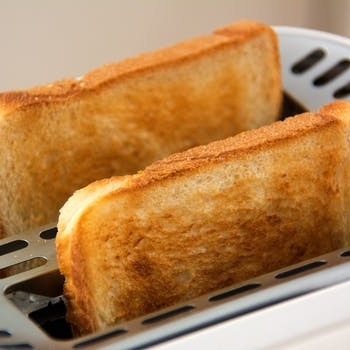 One thing people sometimes do is set plastic (like the wrapped loaf of bread) back on the toaster when it’s still hot. The top of the toaster or toaster oven should never be used to store anything. Remove everything from around a toaster or toaster oven before it’s turned on, or make a habit of not putting anything close to the toaster. Don’t forget to unplug it when you’re finished using it.